Have you ever seen a tangerine skyscraper with very colorful brickwork and terra cotta at many levels? In the 18-year span from 1912 to the stock market crash in October, 1929, Americans adopted automobiles for their local travel, prosperous farmers shifted from mules to tractors, while merchants and businesses adopted trucks for their local deliveries. 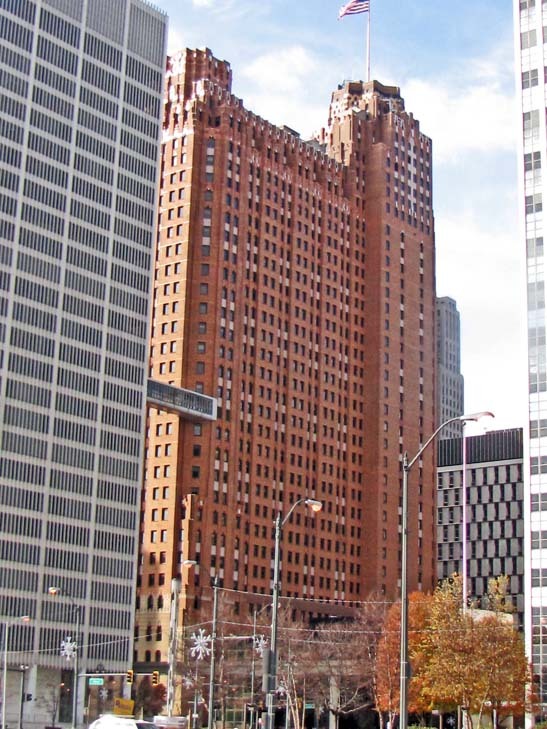 It is no surprise to find that the 1920s were the golden years for skyscraper building in Detroit. Auto firms, their suppliers and their banks were thriving, so they needed much more office space. Downtowns were the centers of activities, so no one was inclined to shift front office activities to remote suburbs. Seventeen major office building went up in Detroit. The skyscrapers included the First National Building (Kahn, 1922), the Cadillac Tower (Bonham and Chaffee, 1927), the Buhl Building (Smith, Hinchman and Grylls, 1928), the Water Board Building (Kamper, 1928), the David Scott Building (Donaldson and Meier, 1929) and the Fisher Building (Kahn, 1929). By skyscrapers, I mean tall and typically rectangular buildings that capitalize upon getting a great deal of office space located on a small amount of downtown land. These were the second generation of skyscrapers. The firms that owned these buildings wanted something distinctive to project an identity. It would be easy for an architect to turn out a building that resembled one down the street. Even today, when you are in the canyons of lower Manhattan, you might think that one building looks much like the next. The Union Trust Company was founded by Colonel Hecker whose impressive mansion graces the corner of Woodward and East Ferry. By the 1920s, it became the city's largest bank. This bank specialized in making home mortgage loans which was unusual since large banks at that time seldom did home financing. The firm prospered as the city grew rapidly in the 1920s with many blue- and white-collar workers earning enough to buy the homes that were built beyond Grand Boulevard. Union Trust also played a key role in funding the emerging aviation industry, an industry with strong roots in Detroit. That is, in the 1920s, automotive engineers experimented with the extensive use of aluminum to reduce the weight of cars but were not successful in developing aluminum auto bodies. However, their technological developments fostered the use of aluminum for streamlined trains and aluminum proved ideal for aircraft. And, into the early 1930s, the most popular commercial airplane was Henry Ford's Trimotor. Frank Blair, the public spirited head of Union Trust in the 1920s, hoped to convey the impression that his huge bank was much "warmer" and more "trustworthy" than other banks. Wirt Rowland—a young architect in his 30s with the Detroit firm of Smith, Hinchman and Grylls firm—was selected to design a unique skyscraper that would be appropriate for Union Trust and convey their values. He invented a new system of external decoration through his use of a brick veneer in warm colors complemented by the extensive use of glazed tile and polychrome terra cotta. Mary Chase Stanton, the inventor of Pewabic Tile, worked closely with the architect on the use of exterior tile. Rowland correctly believed that the use of so much external color on a 40-story building would be striking and unique. It was in the 1920s and it still is eight decades later. This building is different from any other skyscraper you will see. If possible, try to appreciate it in the early morning sun. You might also compare this truly "colorful" skyscraper with the neighboring building that Minoru Yamasaki designed for Michigan Consolidated Gas some forty years later. Above the seventh floor of the Guardian Building, you will see a band of patterned terra cotta in cream, green and vermilion. At a higher level, are parapets set back and trimmed in orange and white terra cotta. At the top of the north tower, is a tower like structure done in burnished gold. Entering the building will reveal just as much architectural ingenuity. Rowland wish to convey the impression of great fiduciary responsibility and stability, so he created an environment that suggests a beautifully decorated cathedral. The barrel-vaulted ceiling of the lobby is richly decorated with colorful Pewabic tiles. The neighboring windows are stained glass with inserts of opaque glass. From the lobby, you can view the lofty barrel vaulted banking room where you made your depositsa room with massive piers almost similar to those you might find in a medieval cathedral. The interior displays much monel metala mixture of copper, nickel and aluminum that produces a taupe colored metal. Rowland also used colorful marble extensively. Some of the lobby walls have black Belgian marble at their base. Above that there are bands of rare numidian marble, a blood red marble mined only in Tunisia. There are two prominent stained glass windows done in intense blues, greens and golds showing American Indian figures in Aztec dress; one holding a shield inscribed with "Fidelity," while the other holds a shield inscribed with "Security." This building occupies a unique niche in the history of skyscrapers. It reflects the application of the Art Deco mode of the 1920s to the design of a building designed to be functional but also convey a strong message about the competency of the firm occupying it. 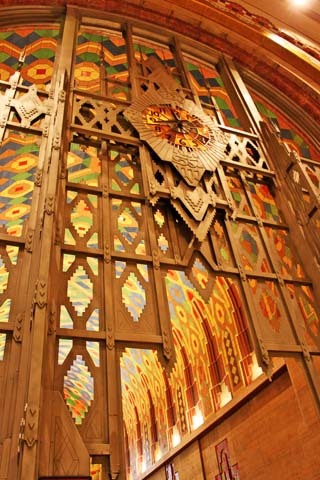 Is there any other skyscraper in Detroit or elsewhere as warm and ebullient as the Guardian Building? Although very innovative and appealing, no architect has ever used this as a template for another building. Just as the boom of the 1920s brought great wealth and beautiful architecture to Detroit, the Depression of the 1930s took away. Union Trust, similar to most other banks in Michigan, failed in February 1932 less than four years after the building was completed. One of the attempts at reorganization used the name Union Guardian Trust Company, hence the presence name for this structure. The building was underutilized for about a decade. In 1942, the U. S. Army occupied the building as headquarters for their officials who supervised the production of ordinance. After World War II, the building was once again underutilized. It was sold at auction in 1952. In 1975, Michigan Consolidated Gas bought the building. In 1983, that firm was purchased by an energy holding company, American Natural Resources. 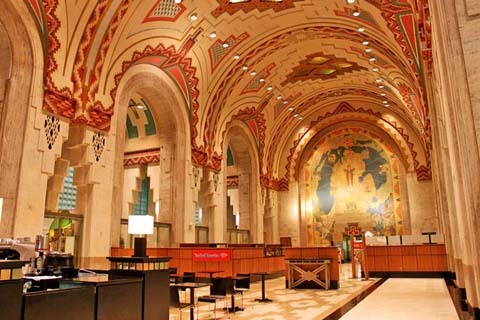 They moved their headquarters into the Guardian Building and, in 1988, began a restoration that returned the building to the great beauty Wirt Roland intended. And, in a déjà vu all over again situation, the Smith, Hinchman, and Grylls architectural firm moved many of their offices to this structure. Architectural Style: Eclectic with an Art Deco theme but with Aztec and American Indian influences.